To take a leap of faith is to jump without knowing how one will land, either physically or metaphorically. For some, purposefully jumping from a plane and placing full faith in the parachute strapped to one’s back would constitute such a leap. Imagine the level of faith involved when jumping from a balloon when the technology of the parachute had yet to be perfected and often animals were sent in lieu of people. While the history of the parachute dates as far back as the Renaissance, the technology was still being developed in the early age of ballooning (1783-1845) as a reliable means of escape in cases of danger. 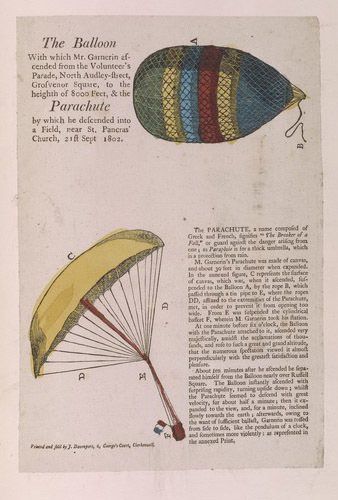 André-Jacques Garnerin’s parachute experiment of 1802 was an early success story. Garnerin’s experiment and others were illustrated in the Scrapbook of Early Aeronautica from the National Air and Space Museum Library. 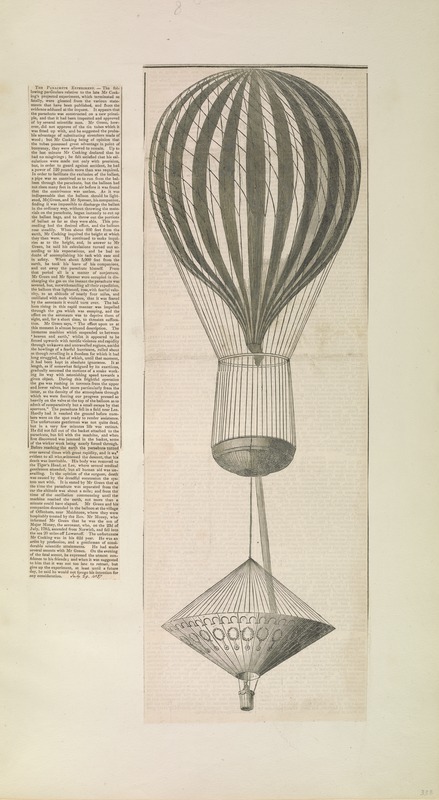 In its nascent phase, ballooning was just as much an adventure sport as it was a science, based one could say, on one part scientific study to five parts foolhearted bravery. 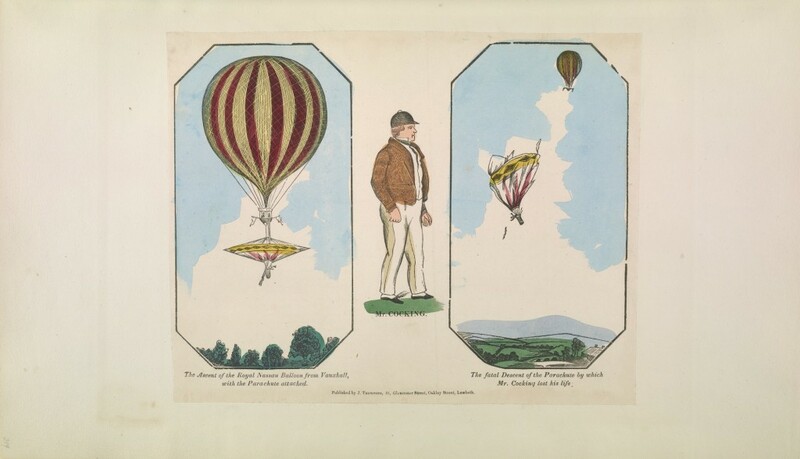 One adventurous aeronaut who this description could apply to was the amateur scientist Robert Cocking, who was a professional water-colorist and would be parachute designer. 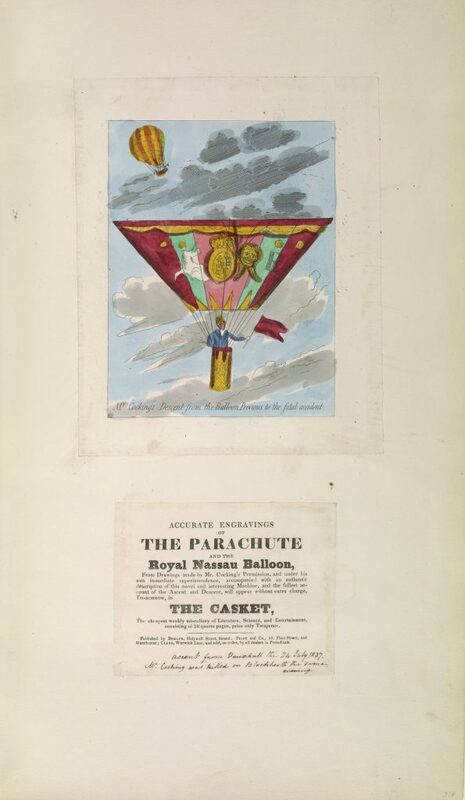 Cocking based his “improved” design on Sir George Cayley’s paper On Aerial Navigation (1809-1810), in which Cayley proposed that a cone shaped parachute would provide increased stability; a concept to which Cocking adhered to for his design of an inverted cone-shaped parachute. After seemingly perfecting the design, and much to the support of his friends and colleagues and on inspection by several scientists; Cocking decided to debut his mathematically verified design at the popular Vauxhall Gardens, London. 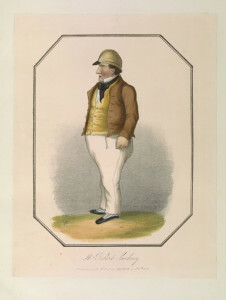 The intention was that he would descend gently to the ground after being released from the venerable Royal Nassau balloon and with much ensuing adoration. In order to achieve such a graceful descent, Cocking devised a system in which his parachute with wicker basket was tethered to the Royal Nassau by a rope attached to a hoop that was fastened to the basket of the balloon, and in addition a tube ran from the balloon to the parachute to offset the absence of ballast. The rope attached to the balloon ran through the center of the parachute so that Cocking could liberate the balloon from the parachute. The eventful day was July 24, 1837. Before the grand ascension, the balloon was raised a short distance, which allowed Cocking, with a little difficulty, to attach his parachute. After this slight glitch, he ceremoniously shook the hands of his confident and enthusiastic friends to ascend in a glorious display, in which the light passed through the transparent material of the parachute and the balloon gently reached for the sky. With a blink of an eye, the situation quickly changed as the balloon rapidly shot up with great velocity and the parachute released. For a few moments the parachute was steady and beautiful to behold, until Cocking went into free fall, first positioned horizontally then oscillating as the parachute narrowed in diameter and then turned over and disappeared from view, shortly after Cocking was discovered in a field by laborers. In one account, he was alive a short while after the crash and still in the wicker basket. Next Post Fall Internship Opportunities at the Libraries! i am related to this man!! You are the historian I was referring to. I know you because of my Nelson connection.